My how I love Coconut Oil!! I always have some on hand, and order it often to ensure I do not run out. Order it, you wonder? 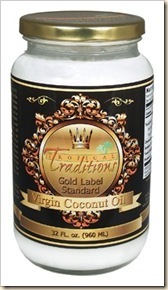 Well I order it because where I live, the coconut oil that I can buy locally is highly refined. So, rather than run out & buy a lower product, I try to keep some on hand at all times!! I love it! I use it all over my house and for tons of things!! 2. Hair Management : I scrunch my hair with coconut oil on my hands once I comb it out after a shower, and let it dry naturally. I moisturizes my curly hair and keeps it from getting frizzy. 3. I use it as a moisturizer, I simply put it on my hands and rub on my hands, arms, legs, anywhere I am dealing with dry skin. Oh yeah, I use it daily on my face and neck. DAILY. This is my moisturizer for my face, PERIOD. 4. I made Lotion Bars with it – and they have gotten rave reviews from friends!! 5. I stir fry with it, make soup, and saute fish and other things too. 6. This may seem odd, but I use it for homemade deodorant too – and LOVE it!! That is just a few of the ways we love coconut oil. There are many options when it comes to coconut oil. I have fallen in love with Tropical Traditions oil, not just because of the quality, but I love the heart behind their company!! Check out many, many PINS on Pinterest with TONS of ideas of uses for Coconut Oil.